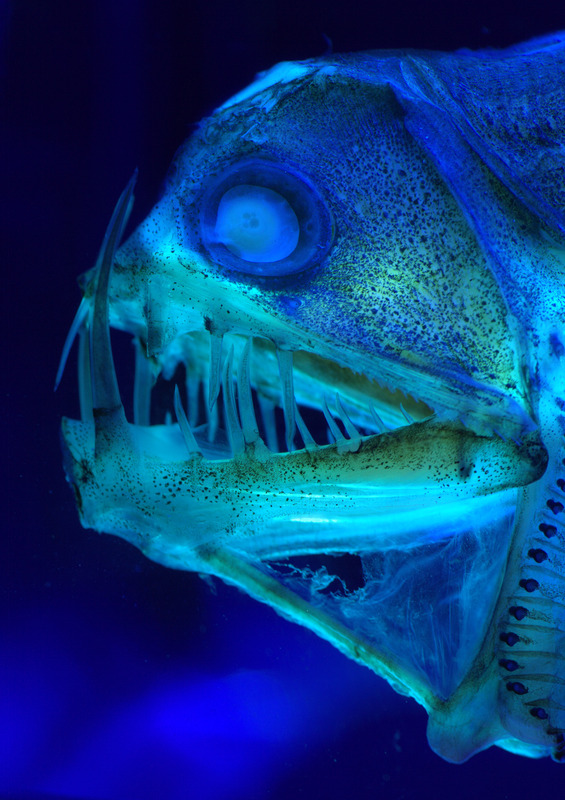 This month the Zoological Museum in Kiel and the GEOMAR | Helmholtz Centre for Ocean Research are portraying the secrets of the deep sea in a joint exhibition. The cooperative exhibition, which opened on Tuesday the 8th of May in Kiel, presents historical scientific collections and links them with the newest results of modern marine research. The exhibition has over 50 objects from zoology and geology, some of which are unique and original. Deep sea animals and spectacular original finds from current geological deep sea research in Kiel make up the main part of the exhibition, for example, a cross section of the chimney of a hot deep sea vent (Black Smoker), manganese nodules or a deep ocean core sample, which shows the volcanic activity of Middle America over a period of 100 000 years. “Combining historical collections with the latest research and combining them in an exhibition is what we plan for the future of scientific museum work in Kiel”, announced Professor Thomas Bosch, vice president of research at the Kiel University, on the occasion of the opening. “Deep ocean research is a central task of GEOMAR” says Peter Herzig, director of the Helmholtz Centre for Ocean Research Kiel. “With this exhibition, more people will get an insight in this, even for us scientists, mostly unknown part of our planet. Thus we are pleased that we, here in Kiel, can now offer the public a showcase into deep sea research” continues Herzig. Sensational objects, brought up into the light of day – some at extreme technical and financial expense – and prepared solely for the exhibition, uncover the fascination of this mostly unknown environment. 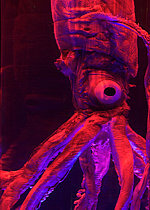 A particular highlight is a three metre long specimen of the legendary giant squid Architeuthis dux. Only 300 specimens of this type have ever been counted and only twelve have ever been exhibited. “With rare original objects the exhibition demonstrates the fascination for an extreme habitat. This is only made possible and viable through the teamwork between the sciences at GEOMAR and Kiel University” Dr. Wolfgang Dreyer, the head of the Zoological Museum Kiel, describes the new museum style. Another special feature is a presentation on Lake Baikal. This Siberian lake with a depth of 1600 meters, is a real freshwater deep sea. During a combined excursion by marine scientists from Kiel and the partner university Irkutsk in 2007, some of the deep sea inhabitants of the largest and deepest lake on earth were caught and can now be admired in the exhibition. Modern lighting technology enables an unparalleled presentation of the objects, some no larger than a finger. Scientifically rare biologics like the bigfin squid Magnapinna atlantica should also prove to arouse great interest. Up until now only four specimens of the bigfin squid are known. A relief map, which allows the visitors to see and experience the depths of the world’s oceans, shows everything from deep sea organisms and their adaptation mechanisms to the current geological research foci of Kiel Marine Sciences. “The deep sea exhibition is an important component in the overall concept of the Zoological Museum. This exhibition, together with the exhibition by the Cluster of Excellence The Future Ocean, will visualize Kiel Marine Sciences in a special way. Moreover the focus on oceanography will soon be expanded with an upcoming exhibition on the Baltic Sea” says Curator Dr. Dirk Brandis in anticipation. 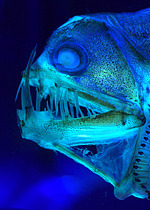 Caption: Chauliodus sloani (Sloane's viperfish): predator of the deep-sea. Highly developed eyes (large lenses: able to register small amounts of light. Light organs as flood lights and as camouflage. Up to 35 cm long. Caption: Perhaps the modt legendary deep sea inhabitant: Architeuthis dux (Giant Squid): Three metres long, of the coast of Scotland at 300 meters depth.